Antoine was born at Bar-le-Duc, the son of René II, Duke of Lorraine and Philippa of Guelders. He was raised at the court of King Louis XII together with his brother Claude, and also made friends with the Duke of Angoulême, the future King Francis I.
Bar-le-Duc, formerly known as Bar, is a commune in the Meuse département, of which it is the capital. The department is in Grand Est in northeastern France. Philippa of Guelders, was a Duchess consort of Lorraine. She served as regent of Lorraine during the absence of her son. The Battle of Agnadello, also known as Vailà, was one of the most significant battles of the War of the League of Cambrai and one of the major battles of the Italian Wars. The Battle of Marignano was fought during the phase of the Italian Wars (1494–1559) called the War of the League of Cambrai, between France and the Old Swiss Confederacy. It took place on 13–14 September 1515 near the town today called Melegnano, 16 km southeast of Milan. It resulted in a victory for the French forces. In Lorraine, Antoine had to face the spreading of Protestant Reformation, against which he published an edict on 26 December 1523. The situation worsened the following year, when a rebellion, known as German Peasants' War, broke out in Alsace. The insurrectionists captured Saverne and tried to conquer Saint-Dié, while the peasants of Bitscherland also rose in May 1525. Antoine launched an expedition which reconquered Saverne on 17 May and crushed a peasant army on 20 May near Sélestat. He subsequently promulgated other edicts against the Protestants. 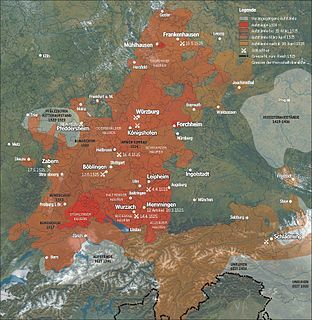 The German Peasants' War, Great Peasants' War or Great Peasants' Revolt was a widespread popular revolt in some German-speaking areas in Central Europe from 1524 to 1525. It failed because of the intense opposition by the aristocracy, who slaughtered up to 100,000 of the 300,000 poorly armed peasants and farmers. The survivors were fined and achieved few, if any, of their goals. The war consisted, like the preceding Bundschuh movement and the Hussite Wars, of a series of both economic and religious revolts in which peasants and farmers, often supported by Anabaptist clergy, took the lead. The German Peasants' War was Europe's largest and most widespread popular uprising prior to the French Revolution of 1789. The fighting was at its height in the middle of 1525. Saverne is a commune in the Bas-Rhin department in Grand Est in north-eastern France. It is situated on the Rhine-Marne canal at the foot of a pass over the Vosges Mountains, and 45 km (27 mi) N.W. of Strasbourg. Charles V was Holy Roman Emperor (1519–1556), King of Spain and ruler of the Spanish Empire, Archduke of Austria, and ruler of the Habsburg Netherlands (1506–1555). The Spanish conquest of Peru and Mexico, and the German colonisation of Venezuela both occurred during his reign. Charles V revitalized the medieval concept of the universal monarchy of Charlemagne and travelled from city to city, with no single fixed capital: overall he spent 28 years in the Habsburg Netherlands, 18 years in Spain and 9 years in Germany. After four decades of incessant warfare with the Kingdom of France, the Ottoman Empire, and the Protestants, Charles V abandoned his multi-kingdoms project with a series of abdications between 1554 and 1556 in favor of his son Philip II of Spain and brother Ferdinand I of Austria. The personal union of his European and American territories, spanning over nearly 4 million square kilometres, was the first collection of realms to be defined as "the empire on which the sun never sets". The title of Count of Zutphen historically belonged to the ruler of the Dutch province of Gelderland. 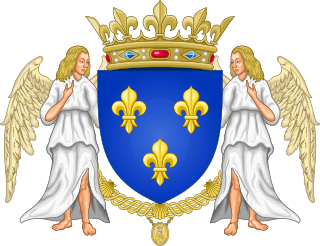 The House of Guise was a French noble family, partly responsible for the French Wars of Religion. Claude de Lorraine, duc de Guise was a French aristocrat and general. He became the first Duke of Guise in 1528. Count of Guise and Duke of Guise were titles in the French nobility. Anna of Lorraine was a princess of the House of Lorraine. She was Princess of Orange by her first marriage to René of Châlon, and Duchess of Aarschot by her second marriage to Philippe II of Croÿ. The Grand Master of France was, during the Ancien Régime and Bourbon Restoration in France, one of the Great Officers of the Crown of France and head of the "Maison du Roi", the king's royal household. The position is similar to that of Lord Steward in England. 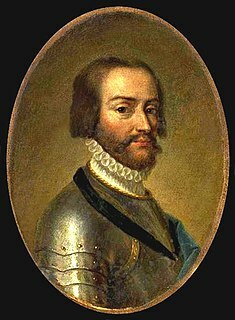 Francois de Lorraine (1506–1525) was the Lord of Lambesc, and a commander in the French army under Francis I of France. He was son of René II, Duke of Lorraine and Philippa of Guelders. He commanded the Black Band of renegade Landsknechts at the Battle of Pavia, and in the bitter combat that ensued between the Black Band and Frundsberg's Imperial Landsknechts, Lorraine was killed. Béatrice Hiéronyme de Lorraine was a member of the House of Lorraine and was the Abbess of Remiremont. She was a member of the household of Le Grand Dauphin and was the supposed wife of her cousin the Chevalier de Lorraine. She died childless. 1 2 3 Carroll 2009, p. 310. ↑ Bogdan 2013, p. 108. 1 2 3 Bogdan 2013, p. 109. ↑ Bogdan 2013, p. 110. ↑ Wood 1923, p. 33-34.